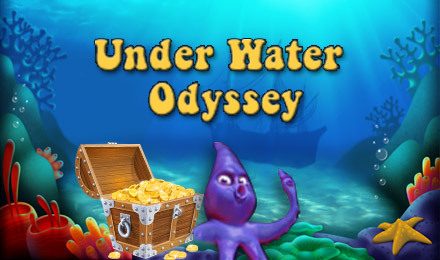 Search for sunken treasure among the creatures of the deep whilst you collect FREE Spins and win up to 500x your wager with Underwater Odyssey slots! Get ready to hold your breath and dive into the depths of this underwater adventure when you play Underwater Odyssey slots! Dive for hidden treasure and explore the life below the surface when you Spin to Win for great prizes! The Bonus Feature can give you up to 500x your bet, while you can win up to 25 FREE SPINS when you land on the special Submarine symbol in the right combination. Make friends with the creatures hiding in the shipwrecks and collect your booty!